Pictures taken in winter: I'll try to replace them after a repeat summer run! 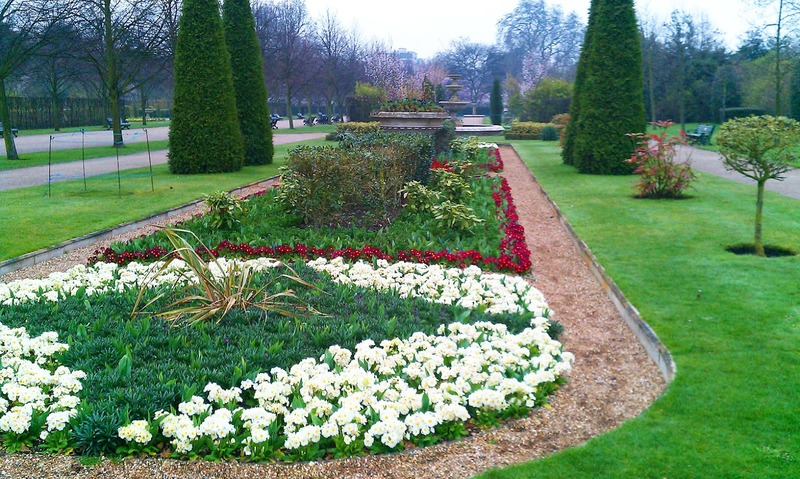 Regent's Park is one of the many great running venues you can find in London. I just ran it again last week while working in the area. 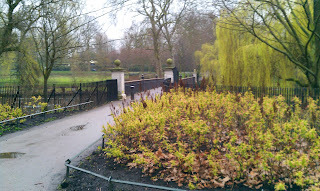 If you are staying in Paddington, Marylebone or Bloomsbury, this is the biggest and nicest green area to run around in. 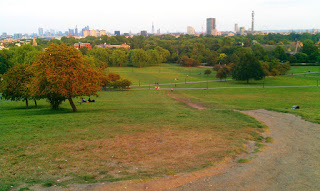 And combined with the neighboring Primrose Hill park -- with its great view over central London -- it offers variety and interest: beautiful gardens, athletic fields, lakes, a zoo, canal boats, bordered by elegant homes all around. 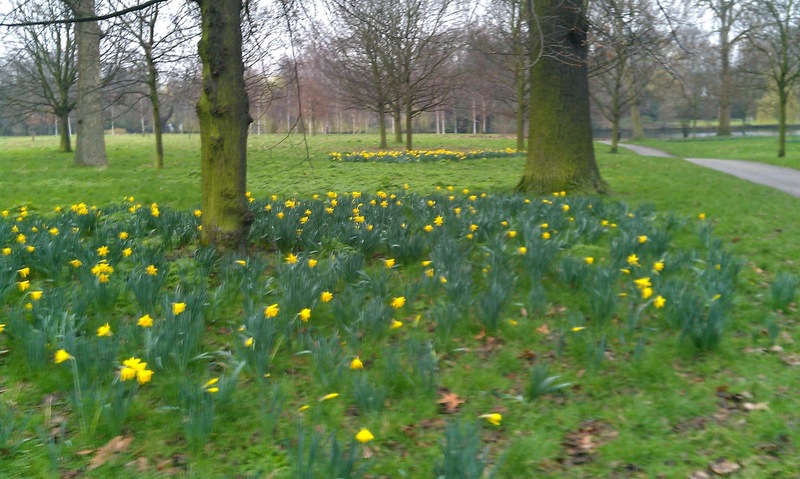 Even in the winter (my last run here was at the end of February) the park is beautiful, and I was surprised at how many different kinds of flowers were blooming. 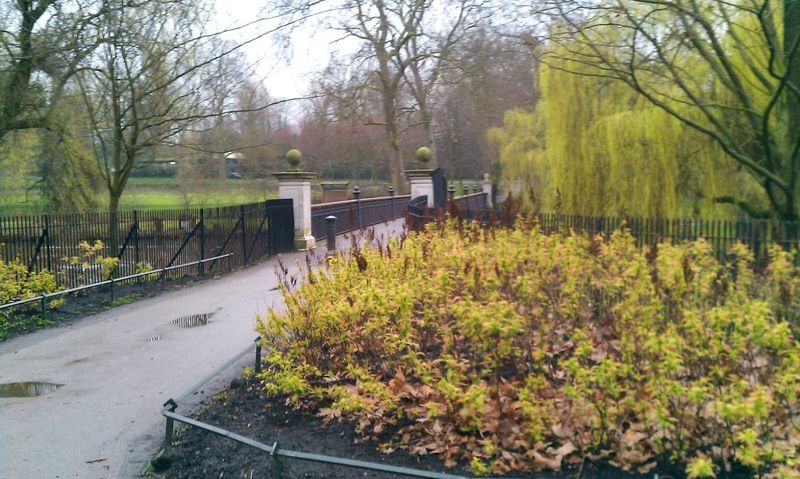 We'll start the run at the southwest corner of the park, near the Baker Street tube station. Baker Street runs into the park's bordering Outer Circle road at Clarence Gate. 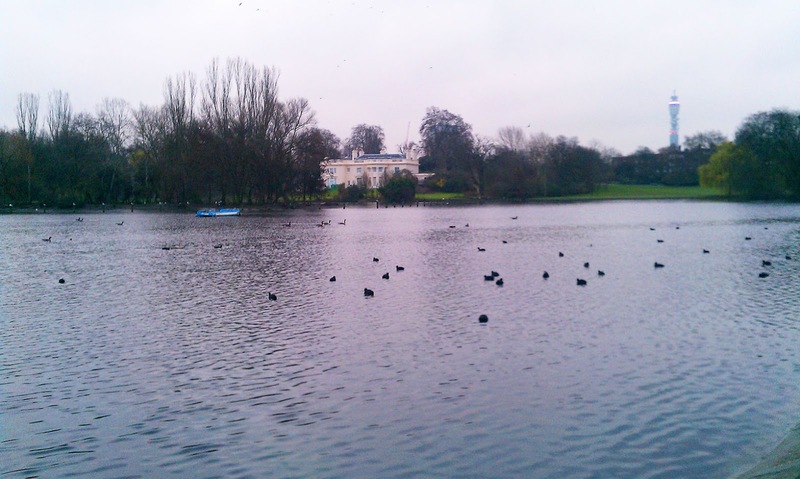 The long, thin Boating Lake stretches along the park edge here, with footpaths on either shore. So let's head towards the water and turn right before the footbridge, to run eastwards along the edge of the park, with the water to your left. Across the water to the left you can see the buildings of Regent's College, sitting right in the park. 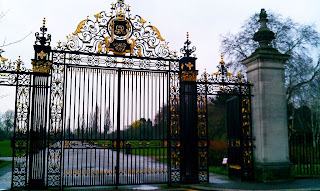 The park land once belonged to a monastery, but was confiscated by Henry VIII and then used as a royal hunting grounds, but has been a public park for last 175 years. You will soon cross York Bridge road and keep running straight ahead, eastwards with the Outer Circle to your right. Before you come to the east edge of the park, turn left on the path leading through the formal Avenue Gardens, with its fountains and beautifully tended plantings. Run straight north on this path through the whole park. It later goes slightly uphill towards a gothic white-stone monument, passing the "Honest Sausage" café. You'll see the athletic fields stretching to each side. In warmer months, they're filled with people playing mainly cricket and (surprisingly) softball, but also rugby and football (soccer). You'll soon see the London Zoo coming up on the left side. The zoo occupies the north end of the park. You will then run over a footbridge over the Regent's Canal, with a few narrow-boats moored along its banks. 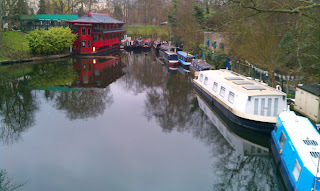 You can have some beautiful runs along Regent's Canal: to the east, the towpath goes to the Camden Locks in Camden Town, and to the west it goes to Little Venice, but that's another great run (see the Regent's Canal Route)! The park ends here at Prince Albert Road. Turn left and run the one block to where Primrose Hill Park begins on the right. Cross the street to the right to the park and take the path that heads diagonally through the park. Head up to the hilltop through the sycamores. This is the hardest work of the whole run. The hill is 256 feet (78 m) high. At the top, take a look around, you've earned the great view. You can see all of central London, with the financial towers of the City to the left, the BT Tower in the middle and the London Eye ferris wheel and the top of Big Ben towards the right. Continue running down the west side of the hill, taking the path back towards Prince Albert Road along the west edge of Primrose Hill Park. Cross the street and follow the path straight ahead, with the zoo to your left. The path soon splits, and you can take either way. They both lead through the athletic fields towards the boating lake. If you take the right-hand path, follow it along the lake as it curves to the left, and comes back together with the left-hand path at Longbridge, a footbridge over the lake. Cross the bridge and you'll come to the Inner Circle. 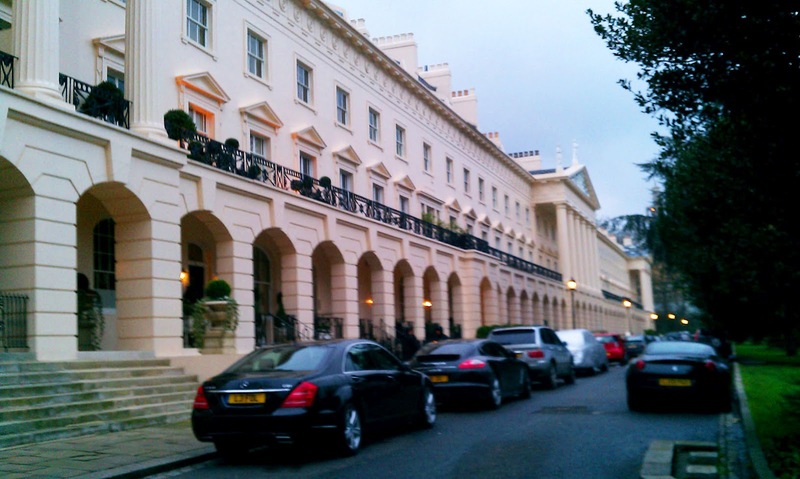 This road is lined with villas from earlier days, and Queen Mary's Gardens in the center. 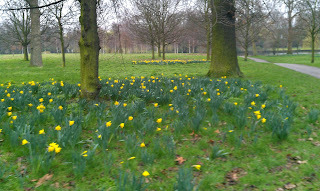 This is the most beautiful, cultivated part of the park. 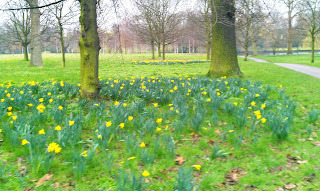 Turn right on the Inner Circle and run past the Open Air Theatre (Shakespeare in the park!) 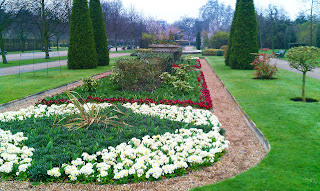 until you pass the Garden Café, where you turn left to take the path into Queen Mary's Garden. 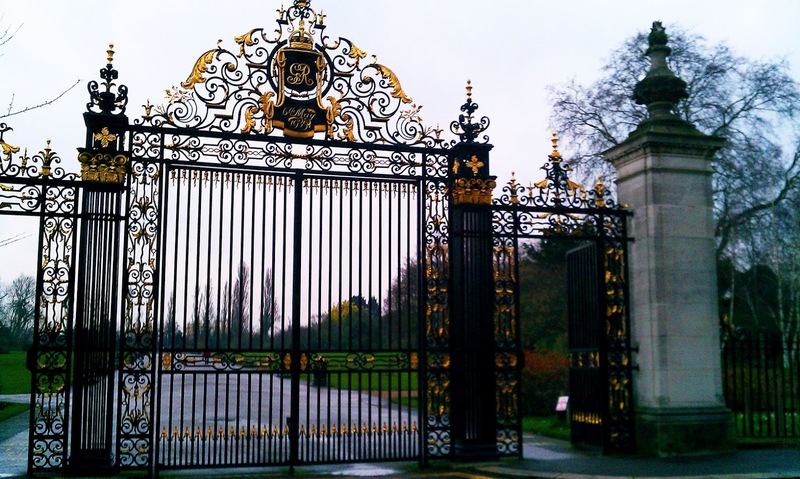 Follow the path along the right edge of the circle, past the beautiful wrought-iron gates, then run along the pond, then through the circular rose-garden. After the rose garden, turn left to take the path back to the center of the gardens and then turn left again to head out southwards through the gates. 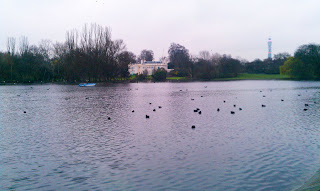 You will come to the long arm of the boating lake again, but this time turn right to run along its north bank. When you get to the footbridge at Clarence Gate again, turn left and cross the bridge to leave the park. Thank you for this description. Will be there in a couple of weeks and cannot wait to do this run. Hi Grace Ma, try clicking on the big headline on the top that says "Click here for route map"! Every route here has a map. What are the best timmings to run if you do not like crowds? Hi Francisco, both times would be good: early morning or evenings. There are never really big crowds while running. I enjoy the evenings because there are other people playing many different sports, but I never feel crowded. I run here every other day at lunch time. It's one of my favourite parks in London.